Moni, a phred from Oklahoma, said it was 52 degrees with 30 mph winds gusting to 50. She was planning on a ride and was curious if any of the rest of us were going to hit the road. I had to steal the photo because I didn't have anything like it. I don't even have a point of reference for the picture. A Montreal rider reported -19C and plans to stay home. A Washougal rider said he had planned to get in an hour even though it was 37 degrees with rain turning to snow in the forecast. Then he confessed that he was going to log his hour on a trainer. A Maryland rider did 32 miles in the mid-30s with an 8 mph wind. Several others in Colorado, S. Dakota and Virginia said they were snowed in. I STARTED to go out riding this afternoon when the temps went above 66 degrees, but then it clouded over and looked like snow. 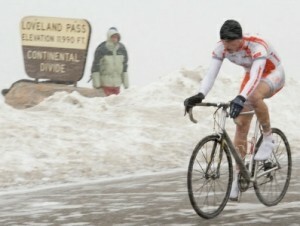 I put on my bike shorts, pulled on knee warmers, topped that with leg warmers and tights. I put on two pairs of socks underneath my Shimano Sandals and covered those with two layers of plastic newspaper bags. I had on my normal bike gloves covered by woolen mittens. Unfortunately, just as I headed out to my bike, I found out that I couldn't walk with all that gear on, pitched forward on my face and twitched like a dying cockroach until my wife came out and helped me up. The descent leaving the driveway – from 14 feet above sea level to 12 feet – probably would have created wind chill that would have frozen my eyeballs. Maybe tomorrow will be warmer. You just can't take too many chances. I’m with you Ken. But the wind bothers me the most. That guy’s riding in 30 mph wind? Heck, I pass when it’s only 15-20 mph. Back in my scuba days, I whined a bit about how “cold” our 74-degree ocean was on a Prodigy bulletin board. Some New Yorker replied that it was SNOWING on her as she got ready to dive that day. No thanks…. was planning to ride with a tailwind and call someone to pick up up at the end of the ride. I can imagine having God give you a 30 mph kick in the behind would be great. Previous PostPrevious Is a Surly Long Haul Trucker in My Future?